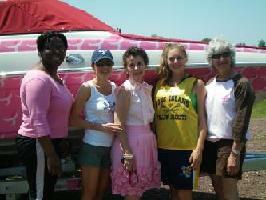 We've posted pictures from Komen events and Komen Friends that we have been so fortunate to meet. We could not do what we do without them. are: Susan Harbace, Principal of PS 29; Diane Pistilli, Assistant Principal of PS 11; Susan Solleder, JCPS Food Service Director; Deb Belfatto, Executive Director and Co-Founder of North Jersey Affiliate; and Constance Piatkowski, Executive Assistant to the Superintendent. 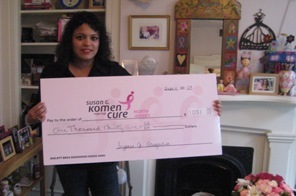 Suzanne who is a breast cancer survivor raised $1031.00 for Susan G. Komen for the Cure North Jersey. 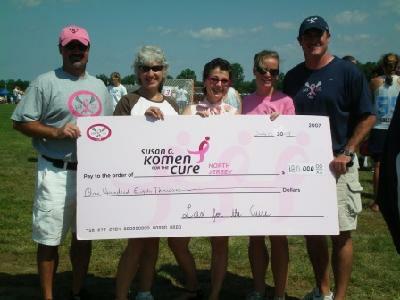 $180,000 raised by 2009 LAX FOR THE CURE! Kudos to Jessica and Charlie Shoulberg for an outstanding 2nd annual Lax for the Cure Tournament at New Egypt High School, July 10 12. Over 3,000 female athletes from high schools throughout the country participated in the event, playing in competition and raising funds for breast cancer. Funds raised will support breast cancer research and life-saving breast health programs for uninsured and underinsured populations. A very special thank you to all participants, coaches, volunteers and organizers who made this event such a huge success. 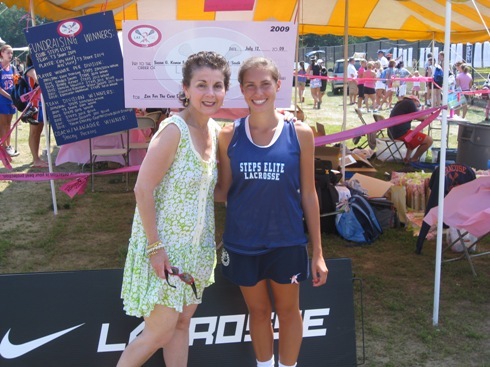 Top fundraisers for the event were Alex and Katy Miele who raised $25,000 in support of their Mom, a two-time breast cancer survivor. Take A Swing For The Cure Raises $800! Park West Diner hosted this event with a pink car and asks guests and passerbys to donate $5 and take a swing at the car representing beating breast cancer. 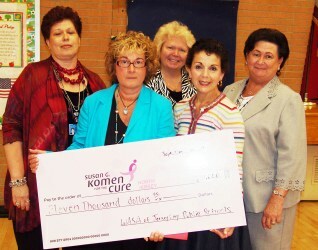 Click here to view additional photo albums of all our Komen Friends. Thank you for joining us in Essex County Branch Brook Park on April 26, 2009 to help us in our fight against breast cancer. Volunteers tie brilliant hot pink ribbons on trees throughout towns which deliver the Komen 3-step, life saving message of early detection.